Ever read those “you know you’re a ‘90s kid if…” posts? Well I have, and I am usually surprised how accurate those things can be. 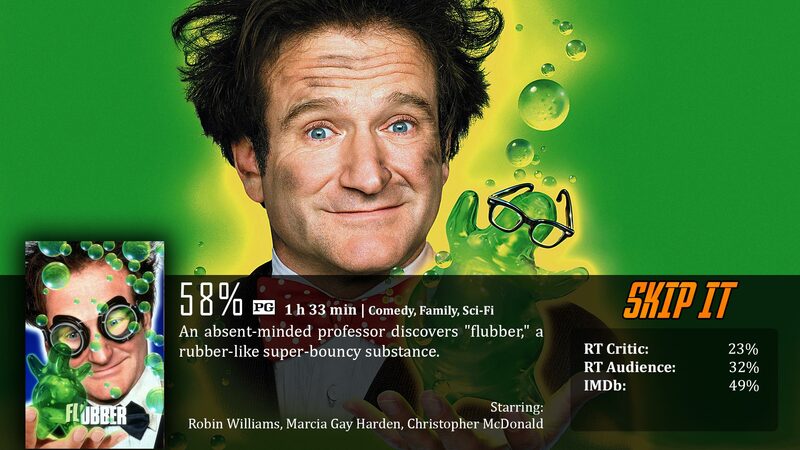 Kids like me who grew up in the ‘90s probably remember Robin Williams in a little Disney movie called Flubber. What was so special about this movie is that not only kids could love it, but parents would want to watch it with them, as it’s actually a remake of an older film called The Absent-Minded Professor. I’m sure I’ve seen both at some point, but it’s been way too long…like…fourteen years long. Plus, who wouldn’t pass up on seeing another Robin Williams movie anyway? Flubber centers on Professor Philip Brainard (Robin Williams), who is a brilliant scientist that has the unfortunate predicament of being forgetful…about a lot of things. The man forgot about his own wedding…three times. He just has a lot on his plate. For two years, he has been working on one scientific discovery that would change everything, but the school he’s working at is shutting down unless they get financial backing soon. That’s when he accidentally discovers Flubber, a flying rubbery substance. The flubber in question can be made into anything, like a cream or spray, or you know…a living organism. Professor Brainard’s brilliant plan to save the school obviously starts with…cheating on a basketball game. For a Disney movie, this film sure is cluttered. Kids like simplicity, and to be honest, there was no good reason why this had to be so wrapped up in a bunch of stories. Heck, it just left me feeling absent-minded. Let’s see, there was the story about trying to save the school, about saving the Professor’s relationsip/marriage, about the Wilson guy trying to steal all of the professor’s work, and of course all of the sciencey stuff with Flubber and of course – the professor’s flying robot that has fallen deeply in love with him. He’s over here, inventing a robot that is actually capable of falling in love, and he’s worried about a bouncing agent? I think you have something backwards there, Professor. For the sake of argument, let’s just stick with the Flubber plot, since that’s the title of the movie and the main reason you’re watching it in the first place. As a kid you get it, these little things are fun to look at and create a heck of a lot of havoc. It’s filled with a lot of physical humor and halfway decent visuals. On a technical level, I totally get it, but on a story level, I don’t. It’s not that great of a story, because he uses this thing to cheat on a basketball game. In the end, that is the main thing he uses it for. It’s cool to see how many things are affected by this mysterious green goo, but there’s only so much you can actually do with “bouncy”. I think the main issue was with the decision of structure. The first version of Flubber he creates is the one with artificial intelligence and a mind of it’s own, but for some reason, that version is mostly ignored in the movie, while he goes on to make other versions of it that don’t have a living concious. If they did this backwards, it would have been better. Imagine the absent-minded professor, who gets so worked up in his work that he crosses the barrier of ethics, and his science creates life. The last version of Flubber would be the one with the mind of it’s own. It would be a completely different movie, but at least the one that’s alive wouldn’t be so incredibly ignored. Seriously. There’s two main scenes with the living Flubber, and these are scenes that are primarily just there for laughs, and don’t advance the story…which is sad. The movie would downright be awful if it weren’t for Robin Williams, who is able to keep that balance of funny guy and serious guy at bay. I don’t really care for anyone else, but at least he fits into the role pretty well. This movie also feels remarkably original and does a great job at making science look fun. This is a Disney movie that should have had an easy plot. There was no reason for it to have so many plots, and the ones they did have didn’t make a whole lot of sense. I honestly don’t think this was written very well, but as it is, kids would probably still like it. Phillip Brainard: I love you with every cell, with every atom. I love you on a subatomic level.